Anyway, how do ping sweeps help identify active IPs if we can’t trust the ping responses? Well, just because a device may not respond to the ICMP echo request from the ping, the device will respond to an ARP request for its IP address on the subnet. It doesn’t have a choice, it’s a requirement for an IP(v4) stack to operate and can’t be blocked by any host firewall. (At this point I’m sure some reader will identify a situation where ARP replies can also be restricted by some means, but I’ll point out that in working on hundreds of enterprise and data center networks, I’ve never found a host that did not reply to every single ARP request it received.) So my goal of a ping sweep isn’t to get ping responses, it’s to “wake up” the ARP cache of a host or network device on the subnet so that the ARP cache can be inspected to determine what IPs are really alive. This information can then be used to identify candidate IP addresses to assign to something. In my role as a consultant often working remotely on things, the ability to propose IPs for assignment to be confirmed by the customer is usually faster than asking the customer to identify the IPs in the first place. Some time ago, Greg Ferro posted a simple Bash script for doing a ping sweep which, if executed from on the same broadcast domain as the subnet you’re sweeping, would work just fine to populate the ARP cache of the host. The nmap tool is another great way to scan a connected subnet for live hosts. But what if you’re working remotely on a segment where you only have access to a Cisco networking device? Well, typing “ping 10.1.1.1,” then waiting for the timeouts, and then typing “ping 10.1.1.2” will get old by about the time you get to 10.1.1.4. You’d want the ability to cycle through addresses quickly. When pinging from a Cisco router or switch, we have another trick we can use to speed things up: if the ping timeout is specified as zero, the router/switch will send an ARP request (if the MAC to IP binding has not already been resolved) followed by the pings, but not wait for any timeout of the ping itself before continuing on. I typically send two such requests to ensure I get a reply. There is another situation that I’ve had occasion to ping a large range of addresses from the attached layer 3 switch is to refresh client ARP caches when migrating layer 3 gateway services from one device to another. In a perfect world, everything would be configured for a FHRP and/or pick up gratuitous ARP announcements when the gateway services move. In practice, it doesn’t always go down that way, so a trick to force a refresh on client ARP cache entries for the default gateway can really ease the pain of a gateway migration. So, how do we do this CLI magic? The IOS Tcl Shell can easily be used for variable-based scripts and with some experimentation, control loops can make pinging large IP ranges fairly painless (if a bit time-consuming). This works to confirm reachability to a set of individual, known targets, but to perform a full-subnet ping sweep this way would require a lot of typing or text-editor-fu. Here it is in action. 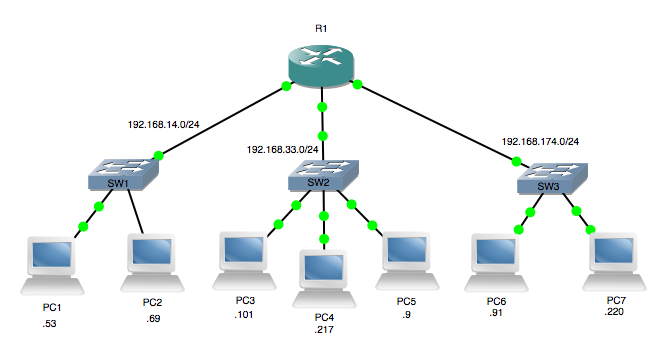 It works, just not very efficiently for our scenario where you need to hit every possible host IP. The “Incomplete” entries can be considered, with high confidence, not to be present on the network right now. The answered entries are basically guaranteed to be active on the network. Notice one of the host targets did actually sneak a response in within the “zero” timeout. That happens occasionally. Doesn’t matter. This is much faster and more useful. Since it tries every IP in the subnet, it can also be used to “force” an ARP update of the pinging device’s MAC address in the other devices on the network. Even this can be slow if you have a number of attached subnets, though. But the looping idea can be expanded further with nesting to produce a list of subnets which should be fully scanned. The one assumption we’re making here is that the first two octets are the same and they are all at least /24 prefixes (or, the ranges need to be specified in terms of a complete /24 at a time). It took about 5-6 seconds to scan those 3 /24s and we found every active host. Scanning 192.168.0.0/16 from the router took about 6 minutes. That’s actually not *so* bad. That still doesn’t make assigning connected interfaces a /16 mask a good idea! So, does this replace good IPAM and documentation? No, but sometimes you don’t have documentation or can’t trust the doc. Using the Tcl Shell for IP scanning can be a quick and easy way to scan a subnet or force an ARP refresh. thanks for the great writeup! I was curious what kind of load this might put on the device you are running it on? Is this something that should really be done during off hours/maintenance window? When I’ve used this for small scans I’ve never had it generate a problematic CPU load, but I think it’s certainly prudent to test cautiously before using in a heavily loaded environment that could be easily upset by a small CPU spike. Thanks for reading!